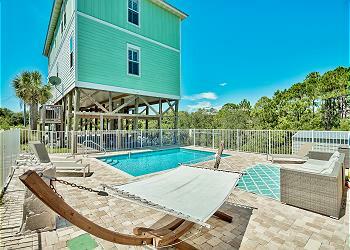 - This home is located directly on Highway 30A, walking/biking distance to the beach! 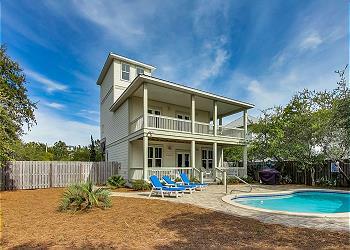 DETAILS: Enjoy the stunning “Heavenly View” in this beautiful and newly built Dune Allen home! With 5 bedrooms, 4.5 baths, and accommodations for 16 guests, this home offers everything you need for your next dream beach getaway! A spacious open-concept first level offers a great flow between the living, kitchen, and dining areas. The living area features a large queen sleeper sectional sofa, two armchairs, and mounted, flat-screen television, making this area a wonderful place to relax after a long day in the sun. The nearby dining area offers seating for 8 guests, with an additional 6 seats at the adjacent breakfast bar. Granite countertops, stainless steel appliances, and lots of bright white cabinetry create a chef’s kitchen perfect for preparing family meals. French doors allow natural light to fill the main level and provide access to the spacious first-floor covered porch, which offers an outdoor dining and sitting area with exquisite gulf coast views. Also on the first floor is a lovely guest room with a luxurious king bed, a twin-over-twin bunk bed, and a private bathroom with a glass-front shower, granite vanities, and dual sinks. Four well-appointed guest rooms await on the second floor and offer a variety of sleeping accommodations. The first guest bedroom features a king bed and private bathroom with a large granite vanity and a glass-front shower. The bunk room offers a comfortable full-over-full bunk bed, a large, mounted flat-screen television, and a shared bathroom with a shower/tub combo. In the queen bed guest room, French doors allow access to the second-floor balcony, and guests in this room can access the shared bathroom. The home’s final bedroom is the incredible master suite, which boasts a beautiful king bed, a large flat-screen television, French doors to access the balcony, and a private en suite bathroom with a shower. Cool off with a plunge in the home’s sparkling private pool or soak in the warm sunshine on the pool deck’s lounge furniture. A short walk across the street provides quick, easy accessibility to the sugar white sand beach of Dune Allen. Five custom 360 Blue beach cruiser bikes provide a great source of transportation and a scenic way to explore all that 30A’s charming beach towns have to offer, including the best dining and shopping on the gulf coast. Your relaxing and long-awaited beach getaway awaits. Contact 360 Blue to book this incredible “Heavenly View” home today! We had a group with 3 families, we loved the property! Even more beautiful that the pictures and so nice!!! We loved that there were 3 rooms with a King bed and a large bathroom. It was like having 3 master suites - the beds were super comfortable We would love to return! We are thrilled you had a wonderful time in Dune Allen! The home is stunning and it's so nice to have those king beds! Thank you for staying with 360 Blue and we hope to have you back at the beach again soon! Beautiful home with access to everything Destin and Seaside had to offer but the location provided privacy and quiet and night. The view of the ocean was beautiful and close. We are beyond delighted to hear how much you enjoyed your stay with us in Dune Allen! We could not agree more that this home is situated in a wonderfully private location yet close enough to everything that the surrounding communities provide. Thank you for staying with 360 Blue, we hope to see you again soon! We can not say enough wonderful things about our stay. First family vacation with our grandchildren (ages 3 - 7). Heavenly View amazed us from the time we walked thru the door. Immaculately clean, spacious and beautiful. We felt 'at home' immediately. Although the weather was a little cooler than we would have liked, it did not stop us from going to the beach each day (beautiful, with the softest sand). We had the pool heated for our stay and enjoyed it each day. Each evening we all gathered in the living room to watch a movie (plenty of space for all of us to sit comfortably). We ended our trip with our Thanksgiving dinner around the big dining room table. We made a lot of memories. Oh, and we loved watching the sunset from the balcony!! If given the chance we would definitely stay here again! We are so delighted to hear how much you enjoyed your vacation with us in Dune Allen! We completely agree that this home has so many wonderful features and is an amazing option for a fun and relaxing family holiday! Thank you so much for choosing 360 Blue, we look forward to hosting you all again soon! Had a great time. Family fun. We are so glad you enjoyed your stay with us in Dune Allen. We hope to see you all again soon! We had a great time. The house had everything you needed. Very clean! The walk to the beach was short and the private pool was refreshing. Nice restaurant with in walking distance also. the Veiws are nice and the neighborhood is tranquil. We enjoyed our stay very much. We are so delighted that you enjoyed your vacation with us in Dune Allen! We agree that this house is a wonderful option for a beach getaway and is a very peaceful place to enjoy your vacation! We look forward to seeing you all again soon! We had a party of 14 and stayed for a full week. We loved Santa Rosa. The house was absolutely beautiful and meet all our needs. The ocean breeze and view from the third floor balcony was very tranquil and soothing. The house had all the amenities of home and is about a 5 to 6 minute walk to white sandy beach. We grilled out, took advantage of the private pool, and used the bikes to take in local scenery. The 360 Blue staff was very attentive to our needs and I would recommend this home for a wonderful vacation. We are so happy to hear how much you enjoyed your vacation! This home really does have it all and is an amazing option for larger groups. We are so pleased that you had a wonderful experience with our team and we hope to be able to help you book a future stay. We hope to see you soon!